I read this article and found it very interesting, thought it might be something for you. The article is called After Blumenthal: A To-Do List and is located at https://hitconsultant.net/2011/02/09/after-blumenthal-a-to-do-list/. The successor to David Blumenthal, M.D., who has announced he’ll resign as National Coordinator for Health Information Technology this spring, will have a lot of work to do when it comes to protecting the privacy and security of healthcare information. One top priority for his successor will be to work with other agencies to build a consistent approach to protecting patient information, says Deven McGraw, co-chair of the Privacy and Security Tiger Team that’s been advising Blumenthal’s office. Plus, Blumenthal’s successor must better define how to balance the need to keep healthcare information secure against the need to give clinicians prompt access to potentially life-saving information, suggests Charles Christian, CIO at Good Samaritan Hospital in Vincennes, Ind. And Dan Rode, vice president of policy and government relations at the American Health Information Management Association, would like to see Blumenthal’s successor take a lead role in tackling the difficult task of providing much more detailed privacy and security guidance that applies to all healthcare organizations, and not just those participating in the HITECH Act electronic health record incentive program. 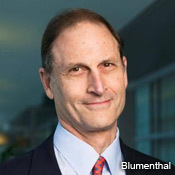 As head of the Office of the National Coordinator for Health IT within the Department of Health and Human Services, Blumenthal spearheaded the HITECH Act EHR incentive program, which mandates participants conduct a risk assessment and mitigate any risks identified. The Medicare and Medicaid incentive program requirements stop short of explicitly mandating the use of encryptionor other security technologies, although they do require the use of certified EHRs, which must include numerous security functions. McGraw says a priority for Blumenthal’s successor must be to carry out all the privacy and security proposals of the Health IT Policy Committee, which is reviewing the tiger team’s recommendations. Those recommendations primarily apply to health information exchange. The Office for Civil Rights is still working on plans for a HITECH-mandated HIPAA compliance audit program. Both OCR and ONC have a long list of unfinished HITECH-mandated regulations and programs. The first one expected this year is a final rule from OCR carrying out modifications of the HIPAA privacy, security and enforcement rules. Also pending is a final version of OCR’s breach notification rule. ONC is working with the FTC on a report about the privacy and security ofpersonal health records. It’s also developing a Nationwide Health Information Networkgovernance rule establishing guidelines for the privacy and security of health information exchange, among many other factors. When it comes to addressing security issues, Blumenthal’s successor will have to perform a balancing act, says Christian, the Healthcare Information and Management Systems Society’s 2010 CIO of the Year. AHIMA’s Rode is hopeful that now that Blumenthal and his team have successfully launched the HITECH EHR incentive program on a tight timeline, his successor can tackle broader privacy and security projects. Creating more detailed federal policies, especially to govern health information exchange, is essential “if we’re going to be successful with protecting data exchanged by all kinds of healthcare entities,” he says. Organizations need more guidance on the security strategies and technologies, including authentication, that they should adopt, he adds.